Images: (Left) Yi Okgeum performing with a pungmul group. (Right) Yang Seokok performing Taepyeongmu. How has the Republic of Korea become a country where an athletic pursuit, like traditional dance, is most celebrated when performed by the oldest dancer? In this presentation, Dr. CedarBough T. Saeji will explain how the best intentions can have unforeseen consequences, demonstrating the ways that cultural policy is implicated in frequent and celebrated staging of elderly solo dancers. She focuses on three themes: (1) Korea’s intangible cultural heritage legislation, which certifies expert performers based in large part on years of participation. Older experts must choose to either continue performing, in spite of failing health, or relinquish their hard-earned title. (2) The accepted belief that communicating the emotional core of the performance is more important than athleticism. This belief facilitates the continued performance by elderly dancers—or may be constructed by ever-older master-dancers who are given the gerontocratic power to define “traditional” Korean aesthetics. 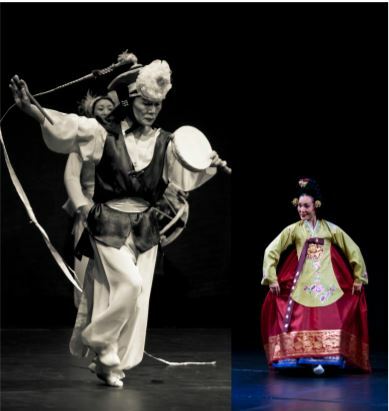 (3) Nostalgia, which is often intertwined with dance performance participation and viewership practices, and which manifests in Korean traditional performance consumption through yearnings for a pre-modern past embodied by older performers.